These are just a few of our Stones Throw Sun Peaks reviews. They were either submitted online or were copied from the guestbook in our 'Best Sun Peaks' condo in Stone's Throw. Since everyone's tastes and expectations differ, we are thrilled to have had so many guests like our ski-in/ski-out condo at Sun Peaks as much as we do. If you are planning a short trip or an extended vacation in Sun Peaks and would like a qoute without having to pay the service fees that the online companies now charge, please feel free to contact us directly. If our condo is not available, check out these Stone's Throw and other properties with a Best Sun Peaks discount of up to 20% (when including VRBO and AirBnb fees you can avoid). We also provide the same level of service with our Best Sun Peaks Townhouse in Trapper's Landing. Book direct through the owner and save - see more info on our BestSunPeaks condo! Other discounted Sun Peaks accommodation and Sun Peaks Vacation Rentals By Owner are also available. We stayed at Nancy and Paul's Stone's Throw condo for 12 wonderful days. Cozy, warm and inviting plus it had every little thing you could ask for to make it a home away from home. Well stocked pantry, cozy fire, inviting hot tub, plenty of room and stunning views out of those amazing windows. Easy ski in ski out location and a convenient few steps away from the regular shuttle bus to the village a few minutes away. Thanks so much for making this a holiday of a lifetime!! We'll definitely be back !! Loved Your Stone's Throw Condo - It Was Perfect! "Paul, we had such a great time at Sun Peaks Resort! Our alpine ski day (after 15 years of no downhill) was phenomenal - cold but full sun, and great conditions. The skate ski camp was equally fantastic - great instructors, hard hard work but we learned so much. Loved your condo - it was perfect for the four of us, and we would love to book it again in the future." 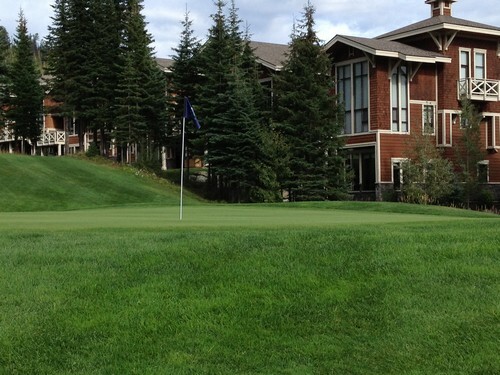 I would highly recommend this Best Sun Peaks condo and playing the Sun Peaks Resort golf course to everyone. Three of us were up at Sun Peaks for a boy's golfing vacation. Our accommodations were top notch and had lots of room for the 3 of us. The place was easy to find, kept extremely clean and was located only minutes from the golf course. Excellent Sun Peaks Accommodation - We'll Be Back! This Sun Peaks accommodations in Stone's Throw was five star! Paul's information binder was above expectations. He reviewed each Sun Peaks restaurant personally! This was our first time to Sun Peaks. We will be back! Thank you Paul and Nancy for making our stay comfortable and worthwhile. Thank you for a wonderful stay at Sun Peaks. Last year we skied at Silver Star and the year prior to that we spent a week at Big White. We like to try a new ski area each year and Sun Peaks came highly recommended to us. We loved every minute of our time there. Your Stone's Throw condo was perfect - we think you have one of the best units there - amazing views and so private. We settled in quickly and felt very much at home. We will definitely be in touch for our next Sun Peaks trip. Had an awesome holiday - the ‘Best Sun Peaks’ condo had anything you'd ever need; very clean as well! Easy ski in/out to our favorite run "The Sticks." Make sure to purchase your lift tickets way in advance to take advantage of the discounts! 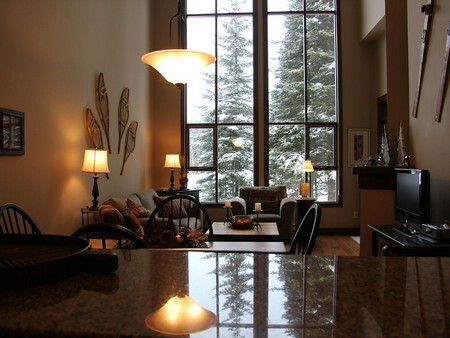 The Best Sun Peaks Condo was an ideal getaway for my wife and myself. While it was only the two of us this time, we easily could have brought our entire family. The condo was very well equipped and it felt like a home away from home. We enjoyed being on the 16th fairway and the view was amazing. Thank you again Nancy and Paul for accommodating us last minute! This place has been one of the best get-away vacations properties we have ever stayed in! It's very spacious, immaculately clean, cozy and very inviting! We love all the amenities that come with this property! Stunning view, floor to ceiling windows, gorgeous kitchen with all appliances needed, and beautiful bedrooms and bathrooms! We are spoiled with hot tub, game boards, videos, Netflix and books offered in your places for our enjoyment!!! The entertainment in your home is endless! We couldn't get enough of your home Paul and Nancy!!! Thank you for making your place so warm and welcoming!!! We can't wait to come back. This place is a must! Offers ski in and ski out location, and two parking spots for your family or friends!!! The property is very beautiful. The kids loved the upstairs bedroom. The Stones Throw Sun Peaks high windows with the view to the mountain is awesome. Loved the hot tub in the evenings after dog sledding and snowmobiling trips. We are already looking forward to going back next year. Perfect for families. Comfortable, clean, convenient and cozy Sun Peaks condo. This Stones Throw Sun Peaks condo exceeded our expectations during our recent four night stay. It had everything you could wish for to cater to the needs of our two couple party. The ski in, ski out location was ideal and very convenient. We would not hesitate to recommend this Stones Throw Sun Peaks unit as highly desirable to anyone. We spent New Year's 2015 at Nancy & Paul's place and absolutely loved it! The Stones Throw Sun Peaks unit is beautiful and well equipped. We especially enjoyed the large window overlooking the slopes and mountains. Sitting in the hot tub at night after a long day of skiing, gazing at the stars and having the snow-covered trees right in front of us was absolutely magical! We are two families with 4 children ages 5, 11, 12 and 14. The kids had a blast up in the loft room where they could hang out by themselves, watch TV or play on the PS3 while the adults appreciated some time for themselves in front of the fireplace in the downstairs living room. Nancy and Paul were very responsive and checking in with us to make sure everything was going well and to our liking. Thanks for a memorable stay. We will definitely be back! Property was well equipped with all the necessities of a well kept home. It truly is a home away from home. Clean, nicely decorated and ideal location. Will return and highly recommend this Stones Throw Sun Peaks property. 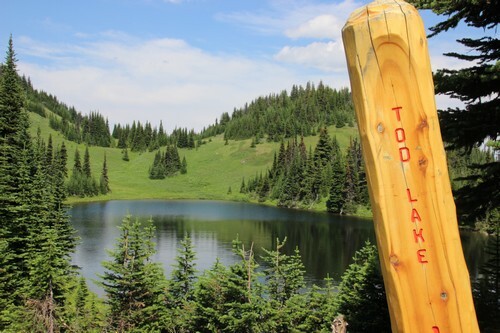 When my wife and I first started looking at Sun Peaks, we came across this listing and knew this was a special place. It was even more beautiful than the pictures, with soaring ceilings, completely open concept with so much natural light and a wonderful hot tub where you could watch the stars from. A few days prior to arrival, I received an email containing detailed driving instructions, codes to get in, and some wonderful tips on where to buy gas and groceries among many other tid bits. After arriving and parking in the heated underground parking garage, we opened the front door and realized the home is packed with amenities including extra wonderful heated floors in the entrance and both bathrooms. The entire home was so clean with ample towels... even separate towels for hot tub use. The kitchen had everything we needed and more and the beds were very comfortable. Hosts Paul and Nancy seem to have thought of everything and we loved the booklet containing instructions on how to operate everything and giving personal reviews and recommendations on every restaurant, cafe, and store in town. The home is just outside of the downtown area and well within walking distance. We actually preferred this area because the short walk to and from town is beautiful and the condominium is nestled away within part of the golf course where it's always quiet. This was our first time to Sun Peaks and we loved it! Everyone was so friendly, the food was fantastic (Follow the in-suite guidebook... Paul & Nancy know their stuff! ), downtown was beautiful and very well kept up, and overall the town vibe is very fun. We will definitely be back again and can only hope that this place is available. Excellent Sun Peaks vacation property! We came to Kamloops for a family wedding and stayed at Sun Peaks with our family. This Stones Throw Sun Peaks condo was absolutely perfect, with comfortable beds, well stocked kitchen (with all the little things included) and fun adventures to explore at the village. We will definitely be coming back in the winter months to ski! Recommended for: Families with young children, Sightseeing, Girls getaway, Romantic getaway, Families with teenagers. The Stones Throw Sun Peaks condo was everything that Paul and Nancy described. Clean and well stocked, (including a nice set of kitchen knives!). We enjoyed our stay very much, made use of the hot tub each evening to soothe our aching muscles after a long day of golf. Paul and Nancy were quick to answer all of our questions prior to booking. All of the details they provided after confirming our booking regarding the condo access, wifi, and parking details etc. made our stay easy and stress free. If we return to Sun Peaks, I would not hesitate to stay again. Thanks Paul and Nancy for letting us stay at your beautiful Sun Peaks condo! This Stones Throw Sun Peaks condo was better than advertised. With 3 kids the "bonus" room upstairs is perfect. Spotless condo and everything you should need. Owners are very organized and give you all the info you need leading up to your visit. We'd stay again for sure. Our family had a wonderful stay in this Sun Peaks Stone's Throw condo. The condo had everything we needed, plenty of space and you could walk to the village in 10 min or ski starting at Morrissey in about a minute, or start the snowshoe trail﻿ from Morrissey. Fantastic location and views, we have already booked to stay here again. Thank you Nancy & Paul for having everything set up and making it a fantastic vacation getaway! Our family thoroughly enjoyed our second ski vacation in this ski in/ski out property. The unit is fully equipped and nicely decorated, and it is hard to leave the hot tub at the end of a hard day skiing. 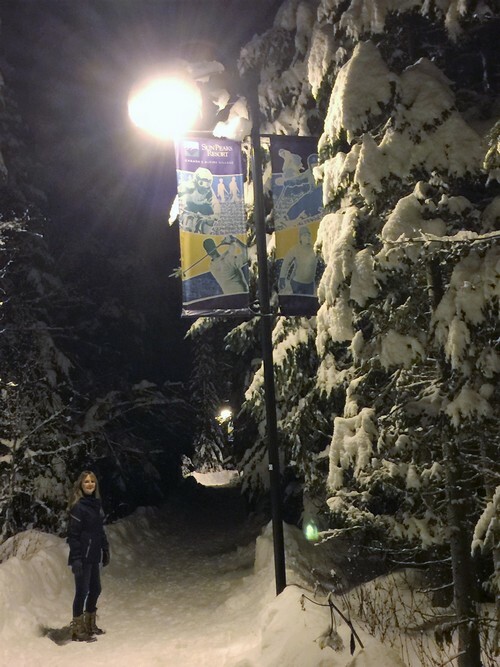 However, the Stones Throw Sun Peaks unit is just a short 10 minute walk through a pleasant paved trail to the Sun Peaks Village Centre and the restaurants and bars. We will be back, and maybe this time in the summer as there is as much to do then as in winter. Recommended for: Families with young children, Adventure seekers, Romantic getaway, Families with teenagers. Beautiful and Serene Stones Throw! We thoroughly enjoyed our 5 night stay at this beautiful Sun Peaks Stones Throw condo. The view was beautiful looking out towards the mountain and this is a true ski in-ski out location. The condo was equipped with everything you could possibly need and we cooked all our meals in once we extracted ourselves from the hot tub. We loved the decor and the thoughtful touches including extra throws for the couch and lots of reading material and movies to watch. The couch in the living room is so comfortable its hard to get out of! Owners were very easy to communicate with and very responsive. We will definitely book this Stones Throw Sun Peaks condo again! Recommended for: Families with young children, Girls getaway, Tourists without a car, Adventure seekers, Age 55+, Romantic getaway, Families with teenagers. Ten out of Ten would recommend!!!! This is a perfect holiday destination for families. We all had the most amazing time at this Stones Throw Sun Peaks condo and can't wait to visit again. The condo just had everything! It was clean and well maintained. Even though we didn't meet the owners they sure made us feel at home in their winter wonderland. This Stone's Throw condo was perfect for our family, including 3 adult children and 1 fiance. The Christmas lights, under the fresh snow were spectacular, and the village was like a picture book. We were able to walk everywhere as there is a great valley trail system behind the main road to the village (about a 10 minute walk). The access to both downhill skiing and cross country skiing could not have been better. The cross country trails were extremely well groomed and from door to start skiing was a walk across the road. The Stones Throw Sun Peaks condo is well kept with everything you need. The first morning, seeing the view at sunrise was breathtaking. The hot tub worked and is private and peaceful. Fireworks on New Year's Eve were more than expected. Owners were prompt in all responses and provided well thought out directions in a manual left in the Stones Throw Sun Peaks condo, as well as advice on local restaurants, etc. Definitely would recommend as we will be planning a trip back ourselves. Recommended for: Families with young children, Girls getaway, Tourists without a car, Adventure seekers, Romantic getaway, Families with teenagers. My family and I really enjoyed our stay at your beautiful condo. It had everything we needed and was clean, tastefully decorated and fully loaded with kitchen supplies, entertainment amenities (books, cards, netflix, DVDs, etc.). We would definitely recommended this Stones Throw Sun Peaks condo to others. Recommended for: Families with young children, Girls getaway, Adventure seekers, Age 55+, Families with teenagers. Our family of 5 (incl. mother-in-law and 2 children) stayed here for a week. It was quiet this time of year, which was fantastic, because we had private access to just-snowed-on runs right behind our house. Not only that, but everyone wanted to stay in each night and play board games and make our own meals, because the Stones Throw Sun Peaks home was just so nice and had such beautiful views. We fell in love!! We really enjoyed our stay here. Everything we needed was included and the owners were excellent about answering questions. We loved the quiet hot tub and had amazing weather. Our Damage Deposit was returned promptly, which was excellent too. The owners of this Stones Throw Sun Peaks unit followed up with us to ensure we enjoyed our stay. Recommended for: Families with young children, Girls getaway, Tourists without a car, Romantic getaway. We stayed up for a weekend race event and everything was prepared for our arrival! The owners made sure we had everything we needed to get there and get settled without too much fuss. The Stones Throw Sun Peaks condo was perfect giving us plenty of space for 5 adults and 1 toddler. Everything we needed was on hand and close walking distance to the village! It was fabulous! Recommended for: Families with young children, Sightseeing, Girls getaway, Adventure seekers, Romantic getaway. We were actually at Sun Peaks for a wedding rather than a getaway but absolutely enjoyed our stay. What I especially liked about Stone's Throw Sun Peaks is that it's away from the hustle and bustle of the Village, so nice and quiet. Whatever amenities we needed were available. Great family stay at Sun Peaks! The Sun Peaks Stone's Throw condo is beautiful. We loved the high ceiling, the decorations and the hot tub. We were 4 adults and 4 kids and we all had so much fun. The kids loved the loft, with the bunk beds, own tv, couch and play station! They also enjoyed the hot tub. There are a lot of board games, movies and books... so many options to keep the children and ourselves entertained. Only downside is that second Stones Throw Sun Peaks bedroom has double bed so prepare to be close to your loved one :) The kitchen is fully equipped. The wifi connection worked really well too. We will be back! Recommended for: Families with young children, Girls getaway, Tourists without a car, Age 55+, Families with teenagers. Great Place - High Quality, Clean and Beautiful! We stayed in this Stones Throw Sun Peaks condo with our two boys while my parents and nephew rented another condo at the same complex. We were very happy with this place! It was clean and well decorated. The furniture and decorations were good quality and all the beds were very comfortable. We wish we could have the wood floors at our home! The large windows really opened up the place and the view of the mountain was beautiful. They provided plenty of options for entertainment for down time too - PS3, Movies, Books, Games, etc. Our boys enjoyed playing in the snow in the courtyard as well as behind the complex on the fairway. The toboggan hill across the street was great too, but they mostly spent their time sledding behind the Sun Peaks Stones throw complex. Getting to the ski hill was easy and once we figured out how to get back it was great. Green runs can get you to the mountain and back if you have beginners, which is nice. Previous renters mentioned the garage height. We made it through with about an inch to spare in our very large Ford Expedition and Thule car top carrier. This Stones Throw Sun Peaks condo has two parking spots reserved. They are pretty narrow spaces, but we were able to squeeze in there. Once we parked we didn't move it because the village is a ten minute walk away. It was nice to park and then just leave it - covered parking was a nice feature to have. Communication with the owners was great - quick replies and a willingness to make sure that we were happy with the Stones Throw Sun Peaks condo. We definitely recommend this place!! I have stayed at Sun Peaks several times and this rental was perfection. It is impeccably clean (including the hot tub), very well stocked and has a great location. I am a bit of a neat freak so finding a place that meets my cleanliness standards is hard but this place accomplished it ably. The owners were terrific to deal with and assisted promptly with some problems I was having making the payment through VRBO. I really appreciated that basic stock was in the kitchen like coffee filters, dishwasher detergent and other basics. Some owners lock them away and it greatly enhanced the holiday experience that all these items were left out by the owners. Towels are all great quality. The view from the Stones Throw Sun Peaks living room is beautiful and the vaulted ceilings lovely. The only thing I would suggest for the owners is to provide instructions on how to ski in/ ski out. We worked it out eventually but the routes at Sun Peaks are not completely clear to a relative newbie. It is a ski in/ ski out condo but you need to know the routes to take and it is different depending when you are skiing in or out. Maybe the owners could leave a laminated map to help people find their way back home to the pristine hot tub. This is a minor suggestion and it may be that there are such instructions and that I just didn't find them. ....A perfect and terrific place. Recommended for: Families with young children, Girls getaway, Adventure seekers, Romantic getaway, Families with teenagers. GREAT STAY AT SUN PEAKS! We recently spent 4 nights at the Stones Throw Sun Peaks condo. We had 2 adults and 2 boys, 8 &12. My parents were also up for 2 of the nights. Everyone had their own space separated from each other so you never felt crammed in. Every bedroom had its own tv. The boys LOVED having the whole top floor to themselves (there is even a window that opens from the loft to the downstairs main area so you can hear what's going on up there). Playstation with LOTS of games was a huge hit as well as large bunk beds. 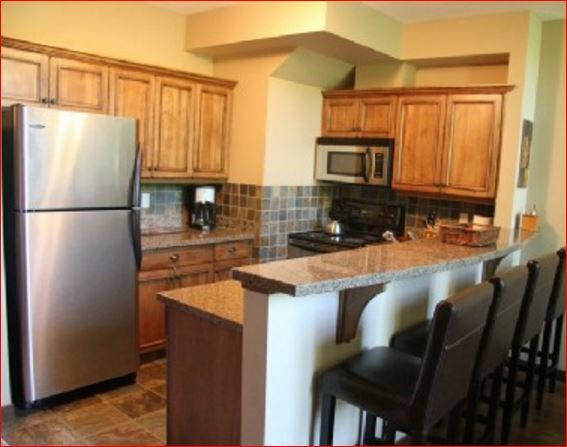 Sun Peaks Stones Throw Condo was very clean and had all the kitchen amenities you could need. Hot tub was great with a VERY private view. Although we did not use the ski in/out feature (kids first time skiing so were in lessons every morning on the bunny hill) it was a very short ski to the chairlift and will definitely make use next time. 2 parking stalls in the very secure heated underground lot made so we did not need to drag our equipment up all the time. The tobogganing hill is literally right across the street! There is so much to do at Sunpeaks you can never get bored! Besides the obvious skiing there are shops, restaurants, sports centre, tubing, tobogganing and our very favorite the DOGSLEDDING!!! Communication with owners was superb, they are reachable within an instant and ready to help in any way! We are already planning our next trip back to sunpeaks! Recommended for: Families with young children, Sightseeing, Tourists without a car, Adventure seekers, Romantic getaway, Families with teenagers. Cozy and comfortable Sun Peaks Condo! We recently stayed for four nights, three days at this great condo in Stones Throw. We didn't need our car at all during our stay thanks to the ease of the ski in/ski out feature. The condo itself was exactly as advertised ... clean, comfortable and cozy ... we kept warm despite the outside temperatures dropping to minus 20 or less each day. The view from the living room window was spectacular. The hot tub was completely private and provided relief after the days on the slopes. Our children loved the enclosed loft area (as did we!). We would definitely stay here again. The Stones Throw Sun Peaks owners were very helpful with comprehensive directions and instructions, plus any questions we had were answered promptly. Highly recommend this accommodation to anyone! The highlight of our family's stay was the Sun Peaks snowmobile tour. Recommended for: Families with young children, Girls getaway, Tourists without a car, Adventure seekers, Age 55+, Families with teenagers. Wonderful Sun Peaks accommodation for families!! This Sun Peaks condo was a fabulous place to meet with my brother's family. The eight of us were totally comfortable with the kids upstairs in the den. The entire place was immaculate and well equipped. The view was great from the deck while enjoying the hot tub, which was rarely empty. Thanks to Paul and Nancy for being wonderful property owners. We highly recommend your Stones Throw Sun Peaks place and cannot wait to come back!! 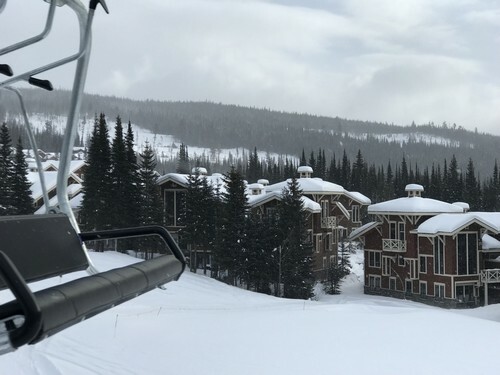 We recently spent a weekend at Best Sun Peaks Vacations' condo at Sun Peaks and we were thoroughly impressed. My girlfriend and I brought my teenage son and two of his friends for a 3 night getaway and we could not have been happier with our choice of this unit. Everything was exactly as described and the unit was spotless. Right from the beginning of the booking process, the owner's Paul and Nancy were very prompt with their correspondence and the process was straight forward and simple. The Stones Throw Sun Peaks unit has all the amenities required and I was pleasantly surprised at how well the kitchen was stocked. We were informed before check-in that the coffee maker wasn't working properly but Paul had a new one delivered right to our door. That is the type of service we experienced from these owners and I would expect any future guests would receive the same. The sleeping accommodations were perfect for our party as I wanted the three boys to each have their own beds so they could refresh for the next day of skiing. The boys enjoyed relaxing after supper by playing video games and usually finished off the night with a long soak in the private hot tub. On the map, the Stones Throw Sun Peaks condo seems to be a long way from the village center but in reality, it's within a comfortable walking distance. Another option is the village bus which stops right up the road. Being from Kelowna, I found the village at Sun Peaks to be a bit more quaint and not as commercial as Big White. In all aspects, our weekend was great. The hill, the weather and of course the condo were spectacular. We couldn't have asked for more and would happily recommend Sun Peaks and Best Sun Peaks Vacations to anyone. Thanks Paul and Nancy. We have been to Sun Peaks at Christmas for the last 8 years and have stayed all over the mountain. We know the Morrissey area but had never stayed in Stone's Throw Sun Peaks. Our whole family agrees this was by far the best place we have stayed at. The unit itself is incredibly large and easily held our two families. The vaulted ceiling with the loft that overlooks the living area gives the place a sense of grandeur that is awesome. The view toward the mountain is spectacular. As I said, we have stayed in many places and we have never had one that is so well equipped (games, videos, all the kitchen amenities that you need as if you were at home). Ski in and ski out from Morrissey is great because we love to get all of the fresh tracks in the morning before it is skied out. The owners even called partway through our visit to check to make sure everything was okay. The hot tub is larger than most in these units so was a great place to relax after skiing (it is also checked daily so there was no worry about it's cleanliness). Obviously, we can't recommend this Stones Throw Sun Peaks condo more highly. We have already booked for next year and we never do that (usually we wait a grab something in the fall but we didn't want to lose this one). You will not be disappointed here!!! This Stones Throw Sun Peaks condo is a gem, and the owners are terrifically responsive and helpful. It's definitely a place we would return to. Our family (2 adults, 2 boys aged 7 and 4) all found things to like. The adults loved the new furnishings, comfortable beds, layout, mountain views, hot tub, and the whole "experience" of Sun Peaks. The boys *loved* the surprise of a bunk bed loft room with big screen tv and a Sony Playstation. But even that wasn't too tempting when compared to the hot tub on the balcony, snowball fights and skiing. The condo has all of the amenities: in suite laundry, coffee maker (when we mentioned that the only thing missing was a coffee grinder, the owners picked one up right away), crazy carpet sleds, bath towels & robes for the hot tub, etc. A tip if you're new to Sun Peaks - buy your groceries before you head up as shopping is minimal at the hill. Oh, one last point: the underground parking has 2 separate access points, each with a different height. We have an SUV with a Thulle roof rack, and worried we'd have to remove it before parking. One Stones Throw Sun Peaks garage door is 6'8", but the other door is 7'6" - plenty of room for our vehicle. Overall, a great experience. My partner and I spent 3 nights at this extremely nice Sun Peaks Stones Throw unit at Sun Peaks. The unit is nicely decorated, clean, and well-maintained, with a well-stocked kitchen, and has a gorgeous view of the ski mountain out of floor-to-vaulted-ceiling windows. The hot tub on the deck outside the main room and master bath is a delight. The unit has a host of electronic entertainment options, but is also very comfortable for just relaxing beside the fire. The heated/covered parking is also a definite plus. You can walk across the road to the Nordic hut, and just down the road to the main village. The listing description was accurate, and the pictures only begin to do justice to the place. The Stones Throw Sun Peaks owners were very helpful and welcoming, and went out of their way to make it a great stay. All in all, a wonderful place to stay. Recommended for: Sightseeing, Adventure seekers, Age 55+, Romantic getaway, Families with teenagers. We recently stayed at this great Stones Throw Sun Peaks vacation home with our 2 boys, and we absolutely loved it! There is plenty of space. The boys were super excited about the bunk beds in the loft and the PS3 with flat screen TV. The view from the panorama living room window is absolutely spectacular. We were lucky that there was already snow on the ground and the view was a perfect winter wonderland! The condo is top notch, super clean and extremely comfortable. We loved using the hot tub at night, when the stars were out. Simply relaxing! Everything is walking distance along a tree lined, beautiful path. We went tobogganing across the street with our boys, and the toboggans were provided by the owners, which was very convenient. 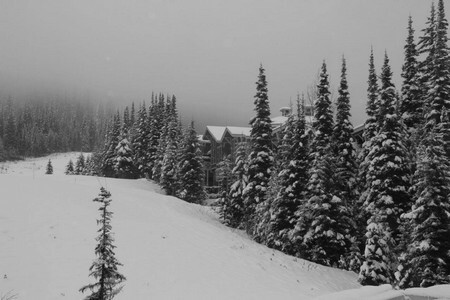 We cannot wait to book our next stay at this Stones Throw Sun Peaks condo, and enjoy it again during Summer or Winter. A truly memorable trip! Recommended for: Families with young children, Sightseeing, Tourists without a car, Adventure seekers, Age 55+, Romantic getaway, Families with teenagers. This Stones Throw Sun Peaks vacation property delivered! We planned a last minute getaway and couldn't have been happier with the accommodations. The property was beautifully decorated and the view from the giant great room window was fantastic. The kids loved the bunk beds in the loft and the Netflix we were able to get on the PS3. The hot tub was great, private and kept spotlessly clean. Thank you so much for our fabulous weekend getaway! Beautiful home at Sun Peaks Resort. We had a great time at this Stones Throw Sun Peaks location. The owners were excellent and the property was set on the ﻿golf course with fantastic views. The location, appearance, and amenities make this a fantastic home to stay when up at Sun Peaks. A definite gem. Our first visit to Sun Peaks! John and I recently stayed at this beautiful Sun Peaks Stones Throw home of Paul and Nancy for 4 nights this past Labour day long weekend 2013, enjoying a whole lot of comfort, relaxation and partaking in the activities on the hill! We enjoyed the perfect weather, stunning views, hot tub on the deck, excellent Mountain Bike XC and downhill rides, along with the solitude and quiet while Hiking the Alpine. We watched hawks soar, deer roam along with a fabulous outdoor concert featuring Colin James adjacent to the base of the ski lift near ‘Bottoms’ pub, one of many free summer concerts that Sun Peaks Resort put on this Summer and with it being our first concert here, it was outstanding! The Condo has it all and is clean, comfortable, and well equipped with everything you need short of your own food and beverages of course. It's a perfect getaway for adults or families and just a 5 minute walk down to the village and yet far enough away to really have that peace and quiet along with great star gazing while in the hot tub. The Stones Throw Sun Peaks living room, bedrooms are spacious and very cozy, and the upper loft has everything that would appeal to the younger generation with videos, gaming, music, double bunk beds and privacy. The owners are very nice people, approachable, responsive and have attended to every detail to making our stay wonderful! 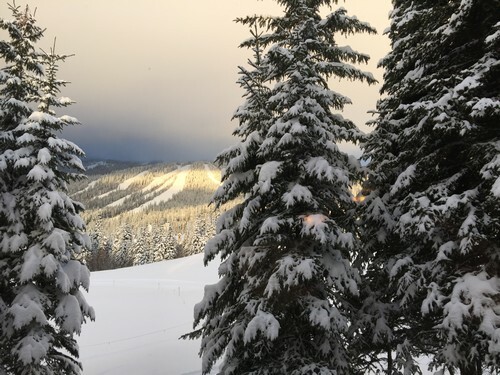 We highly recommend their Stones Throw Sun Peaks home for your stay in Sun Peaks, any time of year and will return for more relaxation and participation in the local mountain activities in the very near future. We recently stayed at this lovely Stones Throw Sun Peaks home for 5 nights, two couples, no children and a whole lot of comfort and relaxation! The ads promised a lot, which attracted us in the first place, and delivered even more than expected. We enjoyed the perfect weather, stunning daily views, hot tub on the deck, the long walks, the solitude and quiet, and some memorable meals at the village restaurants. Watching deer roam and graze, a mama bear frolicking with her two cubs, and a grouse with her three chicks, all from the balcony, was pretty special! This place has it all, is extremely clean, comfortable, and well equipped. It's a perfect getaway for adults and children alike - just at the edge of the village, close enough to all the amenities yet far enough away to really have that peace and quiet. 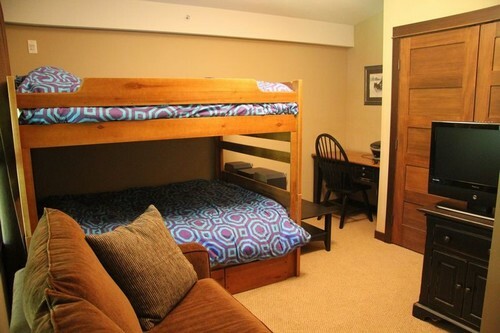 The bedrooms are spacious and cozy, and the "teen cave" in the upper loft has everything that would appeal to the younger set: videos, gaming, music, double bunk beds and privacy. The Sun Peaks Stones Throw owners are very approachable, responsive and have attended to every detail in making our stay truly memorable. We would highly recommend this home for your stay in Sun Peaks, any time of year. Spectacular Accommodations in Sun Peaks! What a great stay! To answer the 'canned' review questions --- the listing description was absolutely accurate, the photos do not lie - the Stones Throw Sun Peaks accommodation is lovely, the property was sparkling clean and perfectly maintained, it delivers on its promises :). We appreciated nice touches including high end bedding and towels, quality cooking equipment and plenty of spices, etc. as well! And the owners provided fantastic information, even including their own personal 'reviews' of the local eateries. We recommend this property without hesitation. We are a family of four, with two adventure-seeking teen-aged sons and have never visited Sun Peaks before this trip. Our family took the lifts to hike among the wildflowers up to Tod Lake, my husband golfed both in Kamloops and in Sun Peaks (the boys joined him for the first nine), our sons took their first downhill biking lesson and loved every minute of it (except for when the mountain shut down for thunder and lightening -- but that's not the fault of the home-owners!). Loved bundling up with our beach chairs one night for a community-sponsored outdoor movie and also enjoyed an outdoor concert one afternoon. Lots of great restaurants too...but we did take advantage of the completely stocked kitchen and cooked a few nights --- discovered a new game on the shelf ("Things in a Box") and that was hilarious; plus watched two of the movies from the great selection of DVDs in the unit. Sat in the hot tub every night after a full day of activity --- what a treat. The boys loved sleeping in the Sun Peaks Stones Throw upstairs loft and the PS3 was a hit, of course, but they were so tired by the end of the day, they didn't really use it much. For winter vacationers, I cannot imagine a thing you'd need! As summer visitors, we did miss being able to barbecue our meals and eat outside --- but we fired up the broiler and it worked out fine. 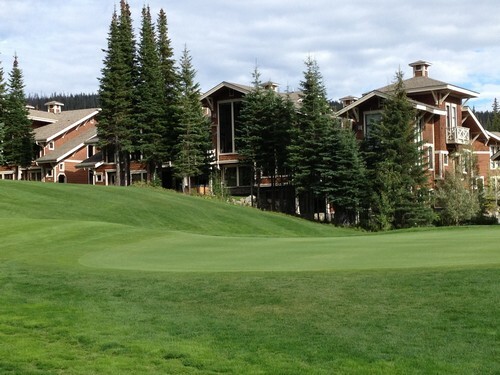 Great location, wonderful amenities, and beautiful Sun Peaks Stones Throw accommodations. The owners have great taste and have paid attention to every detail. What a great experience for our first trip to Sun Peaks! Recommended for: Families with young children, Adventure seekers, Age 55+, Romantic getaway, Families with teenagers. As owners of this Best Sun Peaks Stones Throw condo and our spacious & luxurious Trapper's Landing townhouse, we are committed to doing our best to provide our guests with an overall 'Best Sun Peaks Experience' and we would love to have you stay at our Stones Throw Sun Peaks condo. Book our BestSunPeaks condo directly to get best rates and - no booking fees!